With this month’s release of Power BI publisher for Excel, we’ve improved the experience of connecting to your data from within Excel. 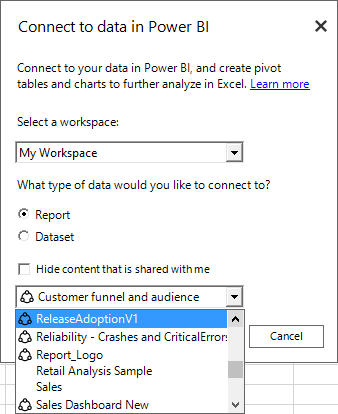 Additionally, with the August update, Power BI publisher for Excel will detect a connection to data with no measures, and notify you with a link to the documentation on how to solve this issue. Read the documentation on this issue for more details. You can always learn more about Power BI publisher for Excel by checking out our documentation. As always, feel free to send your questions or feedback directly to xlpbifdbk@microsoft.com.